We were taking stock of our household items and realized we are running low on some important items. To help you make donating easier, you can shop right from our Amazon Wish List and your items will be shipped directly to us! For an added benefit to RMHCA, shop for us through Amazon Smile. Amazon will give RMHCA 0.5% back on every qualifying purchase! Just log in to your Amazon account at smile.amazon.com and select us as your charity of choice. 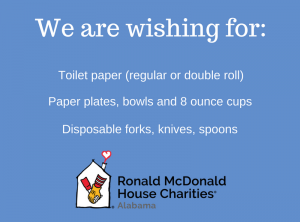 Then, search for ‘RMHCA Wish List’ and shop away! If you’d like to ship to us from a different retailer or drop items off at the House, our mailing address is: 1700 4th Avenue South, Birmingham, AL 35233. Thank you so much for supporting RMHCA and allowing us to provide a comfortable place for families to stay close during their child’s healing process.